That's how many avocados the California Avocado Commission estimates we'll be eating on Cinco de Mayo this year. I'd bet most of those 87 million pounds of avocados will be consumed in the form of guacamole, scooped up with tortilla chips and washed down with beer and/or margaritas. But I'm planning something a little more delicate for Cinco de Mayo this year. Something with protein and some more vegetables. And I'm skipping the deep-fried chips. A little health scare chased me back to the straight and narrow this week. I'd gotten lazy, let my eating habits slip. Numbers don't lie. It's time to regroup. California avocados are back in season, and I know they'll be a big part of my healthy eating efforts. Avocados provide more than a dozen essential nutrients, including fiber, potassium, Vitamin E, B vitamins, and folic acid. The monounsaturated and polyunsaturated fats are heart-healthy. And, of course, they're delicious. 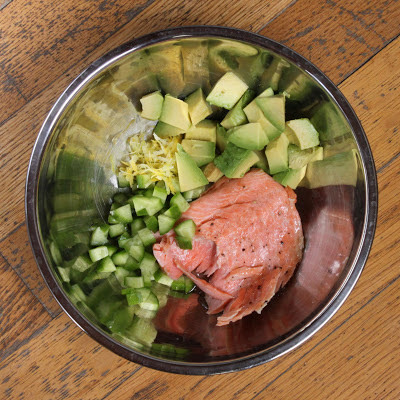 This simple fish salad can be made with any leftover cooked fish, or even with canned salmon. Including the zest of the lemon as well as the juice brightens the flavor considerably, so don't leave it out. Have a happy and healthy Cinco de Mayo! A light chilled salad with heart-healthy ingredients like salmon, avocado and greens. Serve in a scooped-out avocado shell. Put the salmon in a medium-sized bowl and flake it with a fork. Add the cucumber, green onions, lemon juice, and lemon zest; mix gently until combined. Add the avocado chunks and toss gently once more. 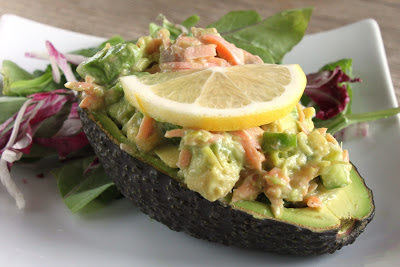 Divide the salmon salad evenly among the four avocado shells. Divide the salad greens between two plates and nestle the filled avocado shells on top of the greens, allowing two per person. Serve immediately. this looks delicious! i love fish/seafood with avocados! With health food that looks this good, I know you'll be able to stay on track:) Seriously, this looks so good. It seems like a much more fresh, healthy and modern version of the Crab Louie salad my Grandmother used to make. Yum! @Paula so glad you enjoyed it - it's one of my favorites!